I always marvel at the fact that cruising spacecraft are so far from anything in the solar system that nothing they can look at appears larger than a single pixel to their cameras. Then, after months and months of nothingness, suddenly one of those pixels starts spreading, growing, occupying two, then three, then five, then ten, and in a mad rush it's suddenly an enormous object dwarfing the spacecraft and overwhelming its instruments. Just as quickly as it all started, it'll be gone, receding behind the spacecraft, which will go on to cruise in empty space for years before another encounter. It's MESSENGER's turn this week to finally get close to something big. 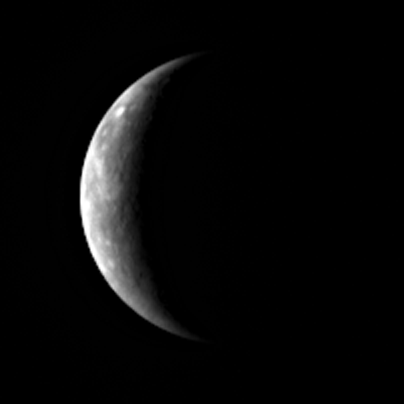 Here's an early forward view of Mercury. The flyby is only about four and a half days away now. Four and a half days of this crescent swelling in the forward view. MESSENGER captured this photo of a crescent Mercury on September 25, 2009, on its way in to a September 29 flyby. This view of Mercury contains a small sliver of terrain never before observed by a spacecraft. MESSENGER will acquire much higher resolution views of this crescent as the distance between it and Mercury shrinks over the coming days. Here's another version of the same image, cropped and enlarged. This version of the image has been enlarged by a factor of two.